Our one and only radiant, Rani M. Shroff, MSW ’77, passed away suddenly in January 2017 at age 72. Rani was a well-loved wife, mother of two daughters, grandmother of three, a beloved sister, aunt, friend, cousin and social worker. She is missed immensely by her family and friends in Vancouver and abroad who knew of her strength and perseverance in the face of a long-term illness. Despite the illness, which she did not allow to define her, she was smart, feisty, courageous, funny and charming. In 1996, she had a consultation with American doctor, Andrew Weil, who marveled at her ability to out run her illness. For decades, her husband and youngest daughter formed an interconnected daily care tripod with Rani so that she could still enjoy traveling, fine dining and adventures. Rani valued kindness, caring and love above all else. She doted on all her family pets and used to ask, “What are they thinking, looking at me with those big, lovely eyes?” Her happy smile and lively humour were two of her best features and earned her much popularity as a psychiatric social worker at Riverview Hospital. 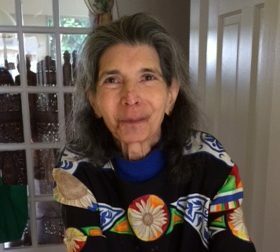 Rani took on life for 72 years, laughed with her loved ones and friends, lived on three continents, traveled extensively, hosted animated dinner music parties with her husband, played a gutsy hand of bridge and enjoyed swimming, yoga and Scrabble. Up until the last, Rani loved mangoes, sushi, chocolate cake, ginger tea and dining at the Teahouse. She will be loved forever. This is a message for ever brave Rani always smiling inspiration to us all, I was there for her wedding and want to remember her ever beautiful Rani. I solute to Hoshang, Vidad, and family for keeping her cheerful and lively.